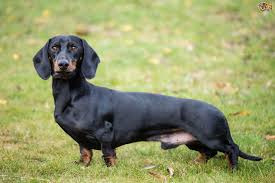 Averaging only about 12 to 24lbs at maturity, it is fair to say that the Dachshund (or Deckel as it is more commonly called in its native Germany) is a small dog. Fortunately, nobody told the Dachshund that and for such a small canine he certainly packs a lot of power and character into that little body. Considering that these dogs were originally bred to hunt badgers who are not known for their tractability, it is not surprising that Dachshunds are strong-willed. With deep chests, powerful hind quarters and even a long tail with which their owner could yank them back to the surface and at an original weight of up to 40lbs, Doxies were bred to go to ground. They were also used in packs to hunt wild boar - another adversary known for its ferociousness. In a very dilute form, some of the original Doxie character can be seen in our modern sausage dogs. They are known for their independance for example - certainly a trait that was required of them when they were hunting. They can be stubborn too and resistant to training. That is not to say that you can't train your Dachshund, just that you may have to work a little harder at it. For most family Doxies, their hunting days may be well in the past, but the breed retains a fondness for burrowing. Making sure they have their own blanket for this purpose might just save your favourite sweater one day. Their barrel chest gives the Daschund a deep voice, oftern surprising guests who were expecting the Hound of Zoltan before you opened the door. 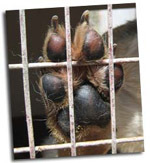 Unfortunately their physical conformation has other effects too. The extra long spine can lead to disc and back problems. If you are interested in adding a Daschund to your family you might just find the perfect companion at your local pure breed, dachshund rescue.